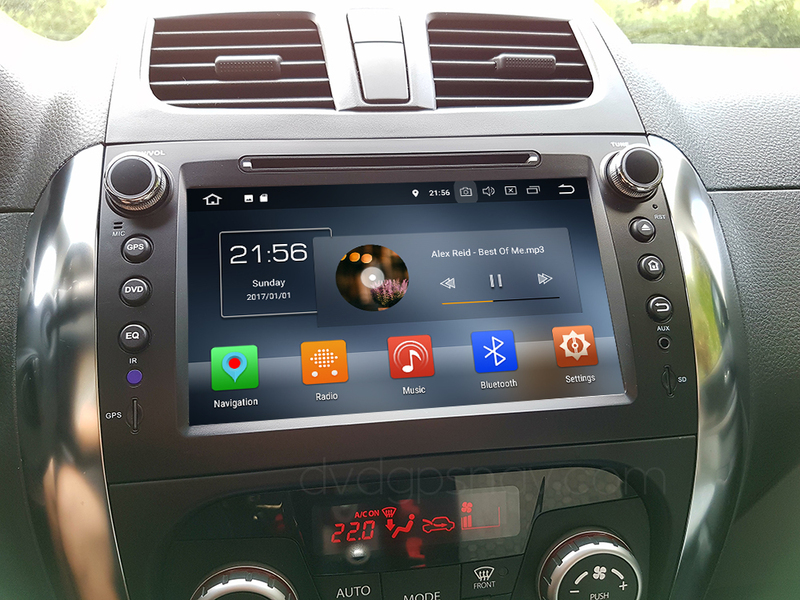 Are you thinking about upgrading your car stereo with an modern-looking Android head unit? For those who have a Suzuki SX4, you are able to replace the factory head unit with an aftermarket Android Suzuki SX4 radio head unit now, no matter your SX4 is a Hatchback model or a Sedan, you can always install a new head unit for a good replacement of factory radio. Firstly, from year 2006 to 2013, there’s hardly no change for the in-dash radio and CD system, so it looks dull and old compared to other car models. Secondly, there are limited features from factory car stereo, just car radio, CD player, even not with USB function, needless to say navigation system, because there’ not a large screen to display maps or play videos, and not able to connect a rear view camera either because there’s no video input from the back of the factory radio and no screen to display rear view images. Since most factory head units are limited on the features, installing an aftermarket unit can really improve your overall driving experience. What can a Android Suzuki SX4 radio do for you? 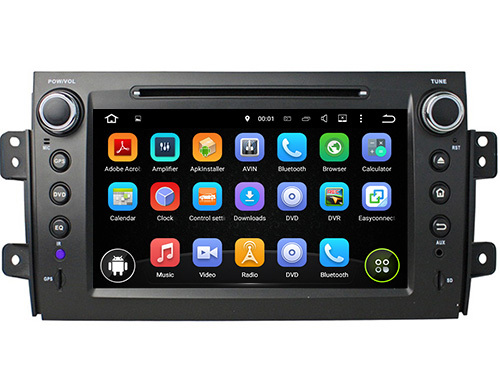 Car DVD player, GPS navigation system, Bluetooth hands free phone calling, Bluetooth streaming music, USB, SD, FM/AM radio, WiFi, Mirror-Link, support steering wheel controls, etc. Unlike the factory CD player, the new Android SX4 DVD player can not only play CDs, but also DVD videos as well, and you can set to watch videos while driving so that your passengers can watch a movie on a long journey, this function can also be turned off in settings. This is a add-on function which the factory unit does not have. 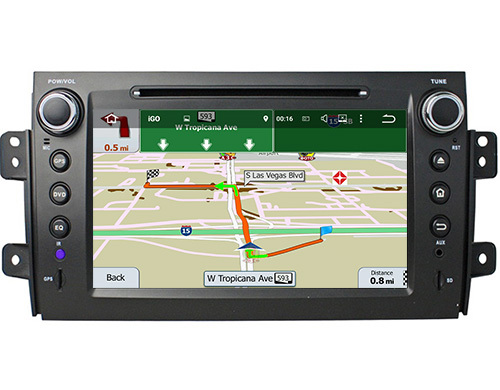 GPS navigation system is built-in, it can support 2D and 3D maps like IGO, Sygic, Tomtom, etc, as it’s based on Android 5.1.1 OS, you are also able to use Google maps after connecting network. The GPS maps are copied into a SD card, then insert the SD card into the GPS card slot, set GPS path in settings, then you can use GPS function. After pairing with your phone, you are able to answer a phone call and talk with the caller hands free without taking your phone near your ear. This is a useful function which enables you concentrate on driving. Nowadays we use our phones a lot, most are iPhones or Android phones to listen to music, and it’s easy to download or delete songs with your phone, so you can listen to your favorite music while driving through Bluetooth streaming music function, without a cord connected. With this function you are able to connect network easily, so that you can download and install Android apps, receive and send emails in the car, browsing web-pages, playing online music or movies. There are many other great features like USB, SD to play music or videos, with RCA back video input to connect an aftermarket rear view camera, supporting steering wheel controls, you can also set your own wallpaper on the screen and boot logo to Suzuki. Installing a new Android Suzuki SX4 navigation head unit is easy, just plug and play, if you are able to remove the factory radio, then you are able to install the new navigation unit, you can check our previous post Suzuki SX4 Radio Removal, Install Suzuki SX4 Navigation DVD to learn more about installation. I have a 2013 Suzuki SX4 hatchback, can i upgrade my SX4 stereo with this Suzuki SX4 Android radio DVD/GPS? This Android Suzuki SX4 radio fits your 2009 Suzuki SX4, if you need you can order it on our site via the link on this post. How much does this Suzuki sx4 radio cost? shipping to Australia? We can ship to worldwide. You can check the unit price and the shipping cost for your country after you add this unit in the cart, just click the link in this post to learn more.